Question: The pie chart below shows the percentage of transportation used y 800 students to come to a school. Describe the chart in 150 words. You should highlight and summarize the information given in the chart. 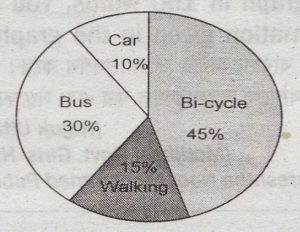 Answer: The pie chart shows the percentage of transportation used by students in a school. According to the chart there is a total of 800 students in the school. They have four means of transportation. These are using bicycle, using car, using bus and by walking. The chart shows that the highest percentage of students use bicycle to go to their school. This is 45%. So, their number is 360 (45% of 800 = 360). The second highest percentage of students use the bus as their means of transportation, and this is 30%. So, their number is 240 (30% of 800 = 240). According to the chart, we find that 15% of students go to school on foot. So, their total number is 120 (15% of 800 = 120). The pie chart also shows that the lowest number of students use car to go to their school. This is only 10% that means, only 80 students. Based on the above information we can say that out of 800 students 680 (360 + 240 + 80 = 680) students use vehicles to go to their school and the remaining 120 students go to school on foot.